Picture your most memorable family road trip. Maybe it was on vacation. Maybe you were lost. Maybe it was a drive to a family gathering. Maybe you felt squished, put-upon and torn between love for those around you and the desire to be far away. Maybe you’re cringing right now at the thought. The Ties That Bind and Gag brings familial angst and mutual torment to the stage, brought to life and made fresh with a bracing sense of humour and the darkly absurd. Three generations of a tight-knit family cram into a rental car to drive to a funeral. Neuroses collide, emotions run high, grievances are aired and over-shared, traffic laws are broken. Buckle up and spend some claustrophobic quality time on a guilt-trip road trip with your nearest and dearest – the people you love and can’t stand or just can’t understand. The ensuing drama’s funny because it’s true and hilarious because it’s heartbreaking. The play marks the Fringe debut for sister duo Juliet Paperny and Anna Mehler Paperny, with a cast of theatrical veterans and new faces. Juliet’s work at LaRue Entertainment has included Filth City and the award-winning The Amazing Gayl Pile. Juliet’s directorial experience includes “Trying” at Alumnae Theatre’s New Ideas Festival, as well as “The Tempest” and “Madness Machine” at Players’ Theatre in Montreal. Anna is an award-winning investigative journalist who has worked at The Globe and Mail and Global News and is now a reporter at Reuters. Both grew up in love with the stage and are thrilled at the chance to make theatrical trouble. Everyone’s been there but nobody says it: Sometimes you dislike the people you love. You wrestle with intergenerational differences, with boatloads of guilt amid unspoken (or shouted) obligation. In a hyper-polarized world, what happens when we attempt frank conversations with the people we know intimately, with the baggage we’d rather forget? What happens if you tell your grandmother she’s racist? 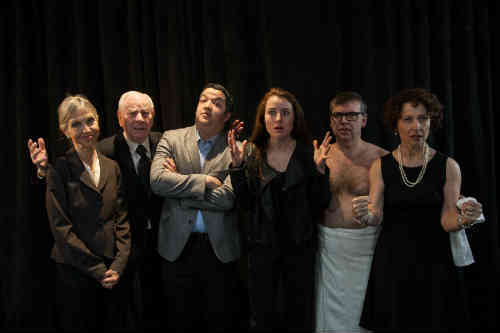 The Ties That Bind and Gag is here to tackle, with urgency and humour, all the ways family drives you mad. It’s a quintessential Fringe play – energetic and button-pushing – and a must-watch for anyone with anyone in their lives who they need, but need space from. It’s for anyone who’s ever had a family.